This is the single most useful book I’ve read in a long time. Winters covers the process not only of becoming an independently published author, but of pursuing success through marketing once you’ve made your book available, and she does it comprehensively. I very much wish I had read this book earlier in my own authorship process. 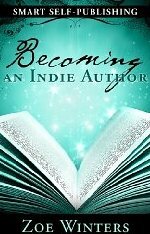 The book begins with a look at the mindset of the successful indie author. Some of Winters’s suggestions might seem obvious (for instance, that you have to set and adhere to your own deadlines), but I think they fall into the category of Things No One Says Because They Seem Obvious, But Actually They Really Need Saying. After all, there’s a difference between sort of knowing something and keeping it front and center in your mind because you understand how important it really is. Winters then takes you through the different ways you might make your book available to authors — print, electronic, audio. She provides extensive information and advice on the print side of things, which makes this book valuable to indie authors who want to move beyond ebooks. She also hits hard the importance of professional editing and decent cover art, a message that really needs to get out there if indies to compete effectively with books issued by the big houses. The latter portions of the book, which focus on how you actually get your book bought and read, are eye-opening. Winters is clearly a master marketer. In truth, I had no idea there were so many ways one could market oneself and one’s work. This portion of the book strikes me as particularly valuable. I haven’t come across these suggestions anywhere else. Winters’s style is colloquial, clear, and engaging. Mechanical errors exist but are minor. Ebook formatting is good. The cover is lovely. This book is highly recommended.